We check over 450 stores daily and we last saw this product for £31 at Talbots. 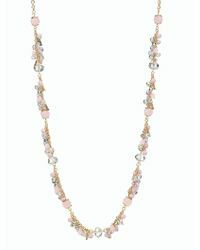 Pull any outfit together in an instant with this long beaded necklace. Dainty quartz and glass gems are nestled together in decorative clusters that beautifully adorn every ensemble. 36" long. Lobster-claw clasp. 12K gold plating.